Owner and instructor, Tiffany Brennan, in her new studio space. 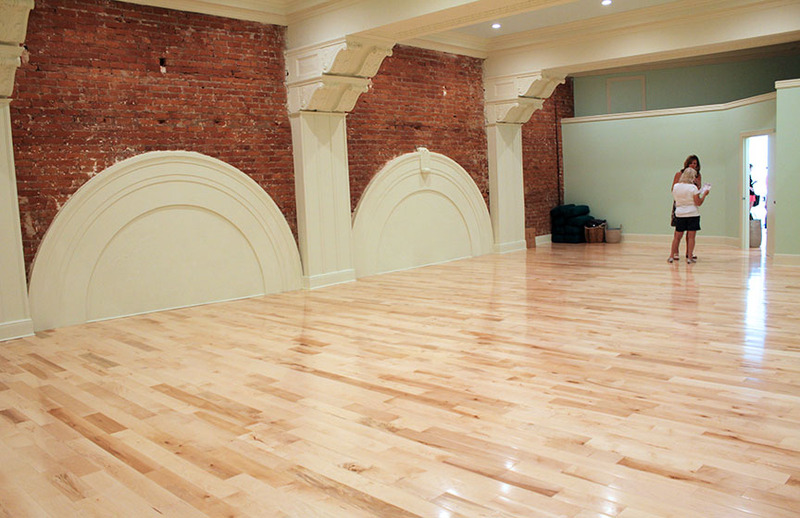 The first thing you notice when you walk into Mint Yoga is that there is room to breath. And controlled breathing is an important part of yoga to quiet your mind and reduce stress. 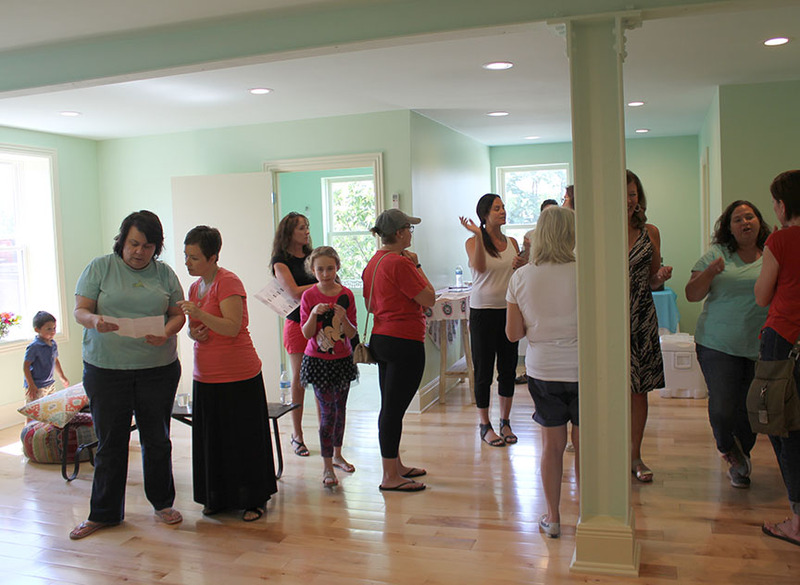 Tiffany Brennan, the owner of Mint Yoga, had an open house last Sunday, August 21st, at her newly renovated studio on 18 N. Ft. Thomas Ave. The studio was packed with potential clients who were admiring the expansive space. It offered just the right amount of embellishments such as an orchid, hand-carved seating, and colorful pillows. 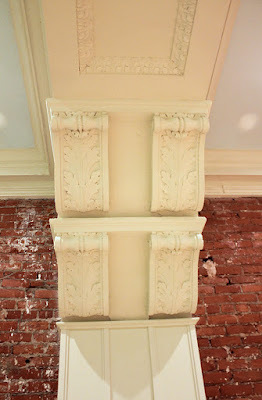 The renovation exposed a long wall and the ceiling to display the incredible architecture hidden from previous renovations. The long brick wall is covered with three large arches and the high ceiling boasts several impressive beams with decorative architectural ornaments. 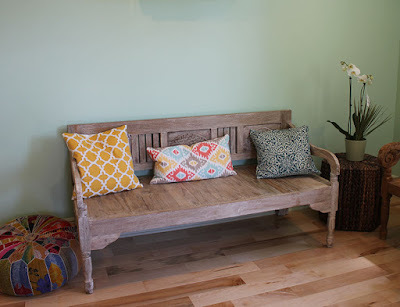 Most of the walls are painted a pale, relaxing mint green. There are no mirrors. Brennan believes, "No mirrors, no judgment." The large classroom after renovations by Quest Construction. Unique seating and accessories add to the relaxing atmosphere. 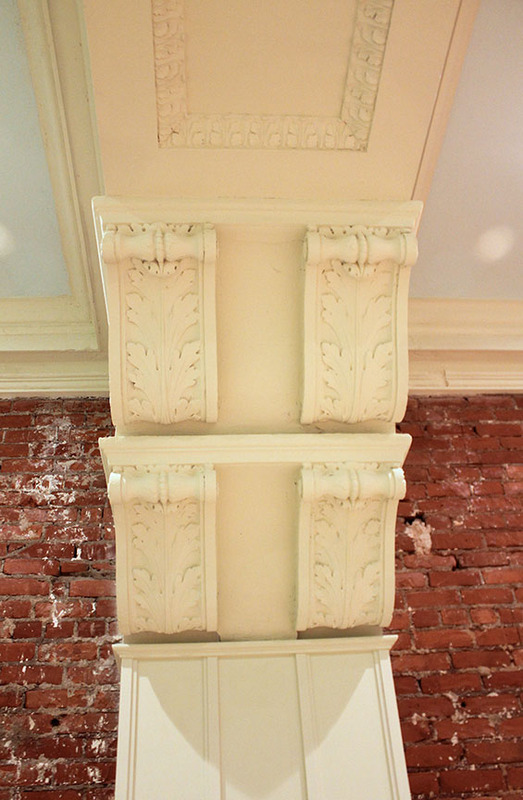 A close-up of the ornamental columns uncovered during the renovation. Brennan signed the lease for the space on February 1, 2016. Once she found the right contractor, Steve Perry with Quest Construction, it was completed in about three months. As Brennan walked around during the open house greeting guests, she exuded the relaxed, healthy glow that her guests were seeking. There were appetizers and drinks available. My favorite was the watermelon served with mint (of course). After working for 15 years in marketing at Limited Brands in Columbus, Brennan and her husband, Dr. Tim Brennan, moved to Clifton in 2011 with their two-year-old daughter. After she had her son in 2012, she became interested in doing yoga to get back in shape. "I noticed that it not only helped me get back in shape, but I also felt more relaxed and didn't worry about things like I used to." Yoga is defined as controlled breathing, stretching, and positional exercises that promote good health, fitness, and tranquility. She became certified to teach yoga in 2014 under Rebecca Bedel. In 2016, she obtained further certification under Kate Noble from Shine Yoga. Brennan previously taught at Mercy Healthplex in Fairfield, and at the University of Cincinnati's Recreation Center. When she decided to open her own studio she had a lot of support from her husband. "I wanted to create a place with a true sense of community. A place where everyone feels like they belong, that they're beautiful, and where diversity is cherished." 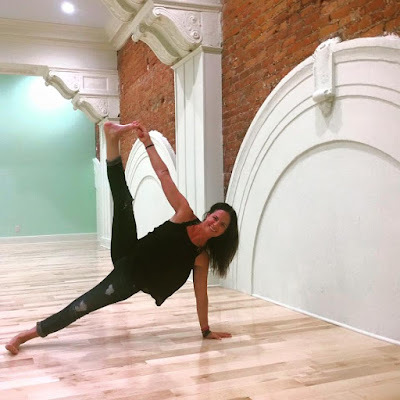 Brennan will be teaching five of the 32 classes available at Mint Yoga. There are classes every day of the week. Times are available anywhere from 6 a.m. on Thursdays to as late as 7:30 p.m. on Monday, Tuesday, and Wednesday. Beginner courses are available as well as several advanced from a variety of yoga styles. There is even a Pre Natal class for pregnant women. Currently, there are over 11 different certified instructors, two of which are men, with a diverse age range. Jenny Rice, a popular instructor from Fort Thomas is teaching three of the classes. her business manager, Nicole Schilling, is on the far right (mint green top, black pants). Brennan's business manager, Nicole Schilling, was kept busy at the open house answering questions about the different packages available for members. There is a Founders Pass with a whole year of unlimited classes, an unlimited monthly contract, and packages of 5, 10, 15, and 20 classes available. There is also a discounted pass for high school and college students. "Anyone that buys a founders pass before August 28th gets 30% off the cost and all other packages are 20% off." says Schilling. Once the first class starts on August 29th, these discounts will no longer be available. "You can purchase all the options at www.mintyogastudio.com," said Schilling. Mint Yoga has done a great job of creating a warm and inviting space, offering a wide variety of yoga styles, and instructors from diverse teaching backgrounds.